Self Adjusting Clamp To Fit Most Poles up to 2" in diameter. 4-Light has an outside diameter of 8". 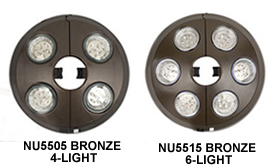 6-Light has an outside diameter of 9". ENJOY SUMMER EVENINGS AROUND YOUR OUTDOOR TABLE BY ADDING A LITTLE LIGHT. 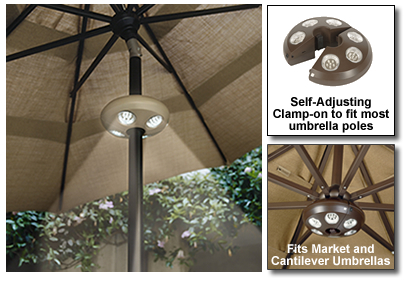 The umbrella light combines a strong light source with a self-adjusting design that fits almost all umbrella poles. When fully charged, the umbrella light will provide light for upwards of 6 hours. It is powered by 24 long lasting LED lights that will last at least 30,000 hours. The light includes an AC adapter and rechargeable batteries, so you just plug it in to recharge.